I find that East meets West makes for a dynamic combination in the scheme of things. Just take a look at all if the more exuberant partnerships in history: Caine and Able - Laurel and Hardy - Abbott and Costello - and Clinton and Lewinsky. In each case, there has always been a diametrically opposed stance at the core (or maybe a slight stain). Also, this type of thing can be seen in this film as well! One Directed by Brett Ratner; and Starring: Jackie Chan and Chris Tucker. It was made in 1997, and lasts for 97 minutes. I am sorry to say that Hong Kong Police Detective, Inspector Lee (Jackie Chan), is a very unlucky man at the moment. Well, for a start, he is requested by the Chinese Consul, Solon Han (Tzi Ma) to investigate his daughter, Soo Yungs, kidnapping in Los Angeles. Worst still, is when flies over there to start his investigations, he is delayed from doing so by Detective James Carter (Chris Tucker). Please note, Carter does not really want to do this at all. In fact, the only real reason that he is, is because he was told to do so by his 'supposed' superiors in the FBI. Still, I that's most probably why Carter goes against order's over time, when he eventually discovers that Lee is a very capable cohort indeed. Moreover, when Carter also accidentally intercepts a telephone conversation between the FBI and the kidnappers, he and Lee are then forced to team-up, to sort out this situation - their way! However, 'their way' isn't always the 'official way' - because Lee and Carter do seem to find 'a way' to p*ss off both the FBI, the Police, the kidnappers, and Consul Han - resulting in them both getting kicked off of the case. Thankfully, though, with some help from Carters alleys, Tania Johnson (Elizabeth Pena), plus some luck, some gumption, and some street-wise savvy, they seem to get back on track once more, and figure out that the only way to save Soo Yung, is to fight the kidnappers on their own terms. Ha! I suppose that is why what next transpires is a right oriental palaver, huh? As it's anarchy in Chinatown - its a pain in the knee at the Convention Center - and all in all it is a devilish decree for all involved. Now before I give you my 411 on 'Rush Hour', please allow me to give you a bit of back story on one of the main reasons why this film came to be in the first place - particularly, Mr Jackie Chan. Back in the day, Jackie Chan has a very tough time of it in the movie business. He was first marketed as the 'next Bruce Lee' - which did not really pan out to well for him. And then, when he did start to make a name for himself - he could not seem to break into the American marketplace. But why was that? Well, nobody seemed to have a slant on how to utilize him properly you see! At the time, films like 'Snake In The Eagle Shadow' was too Chinese for American movie goers - and films like 'Cannonball Run' only showcased Jackie's talents in a very meager way (click on the appropriate links for the review). Thankfully, though, as time pasted, director, Brett Ratner, came along, and tried to reverse this slant with this film. 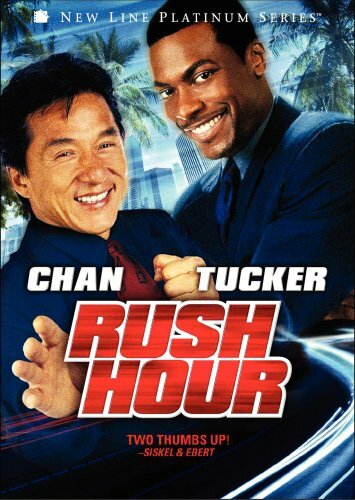 OK, to put it nicely, 'Rush Hour' is a westernized version of a Jackie Chan film, aided and abetted by Chris Tuckers comedy, and Brett Ratners love for Hung Kong cinema. It is a good film if you want to see a Honk Kong film low on Kung-Fu and high in character - and genuinely it has some memorable moments scattered through out. Though, for all intense and purposes, it is a pop-corn buddy movie, overlaid with a touch of East meets West hi-jinks. Granted, this may sound like a negative connotation in some-peoples minds. But in all honestly it is a nice film, paying homage to many great oriental classics, such as: (1) Jackie’s pot-catching ability from ‘Drunken Master’. (2) Jackie’s bus jump and tower dive from ‘Police Story’. Plus (3) The title sequence and music is an updated version of the Bruce Lee film, ‘Enter the Dragon’. However, whilst saying all of this, I do have to ask myself one simple question - is this all enough to make a great film? Errr? Maybe not ‘great-great’, but certainly ‘fun’! Moreover, this ‘fun’ is largely down to the two main protagonist of this film - Jackie Chan and Chris Tucker - whom both elevate this movie to something more than it would be without them. Ha! For this alone, this makes ‘Rush Hour’ well worth seeing. Good film, nice homage.